February 18, 2016, 4:00 P.M. EST. Carlos Ruiz stood outside the clubhouse at Bright House Field on Thursday morning and greeted some of his new teammates with a nod and a smile. "There's not too many familiar faces," Ruiz said. "Things are different." 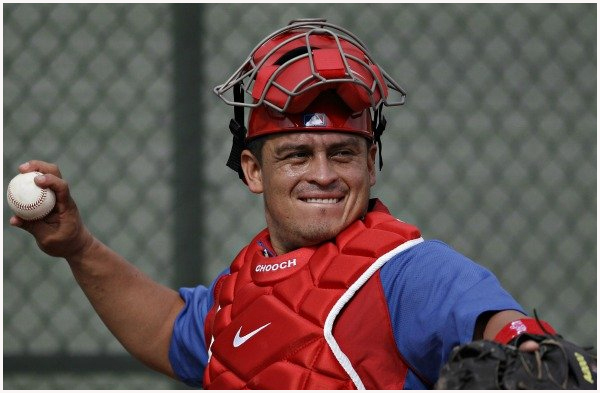 The 37-year-old catcher finds himself in the twilight of his career, stuck in the unenviable position of proving he still can play at a high level while also mentoring the young unfamiliar faces that dominate the Phillies roster. "I’m going to try to help everybody," Ruiz said Thursday, prior to the Phillies first workout for pitchers and catchers. "I’m going to try to enjoy every day, every single day. That’s the thing; I’m happy and I like to work. I like being around the young guys. They make me feel young too." Ruiz hit a career-low .211 with 22 RBI and a .575 OPS (59 OPS+) in 86 games last season. Meanwhile, Cameron Rupp, 27, hit .233 with 28 RBI and a .675 OPS over 81 games. Though neither excelled at the plate the edge for the starting job is with Rupp. "It's tough to be in this spot, but I get it," Ruiz said. "I'll do whatever is asked of me, but I believe I can still do a lot." Ruiz is in the final year of a three-year, $26 million contract. He'll earn $8.5 million this year and has a $4.5 million option available for 2017 though the Phillies can buy him out of the option for $500,000. For more than a decade Ruiz has arrived in Clearwater in mid-February and opened spring training with an understanding of his role with the club. That certainty is gone. "I can only control certain things," Ruiz said. "I do my best day in, day out. That's all I can do. I don’t know how long I’m going to be here. I know that I’m going to enjoy all my teammates"
Coupled with Ryan Howard, Ruiz is the last remaining link to the Phillies 2008 championship season. "I miss those guys," Ruiz said, speaking of departed stars such as Jimmy Rollins, Cole Hamels, and Chase Utley. "They're part of my family." - The Philadelphia Baseball Review is the top baseball news source in Philadelphia, providing news coverage and analysis of all things baseball related in the Philadelphia region.